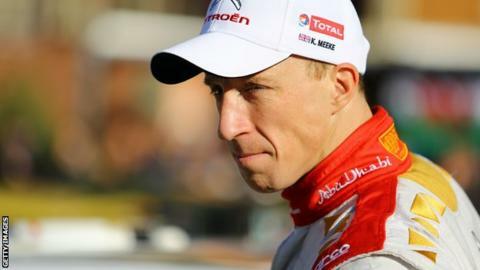 Dungannon driver Kris Meeke finished in fifth place in Rally Spain to move up to fifth position in the World Rally Championship standings. Norway's Andreas Mikkelsen took his maiden win in the series when leader Sebastien Ogier crashed out of the lead in the final speed test. Mikkelsen beat Volkswagen team-mate Jari-Matti Latvala by 3.1 seconds when Ogier smashed into a roadside barrier. Spaniard Dani Sordo was third in a Hyundai, a further 18.1 seconds behind. The final round of the championship is the Wales Rally GB from 12-15 November.